It's not just the Great North Run that is happening this weekend but it's also the start of the third Sunderland Restaurant Week. This is when eateries all over Sunderland serve up delicious food at even tastier prices for a whole week. 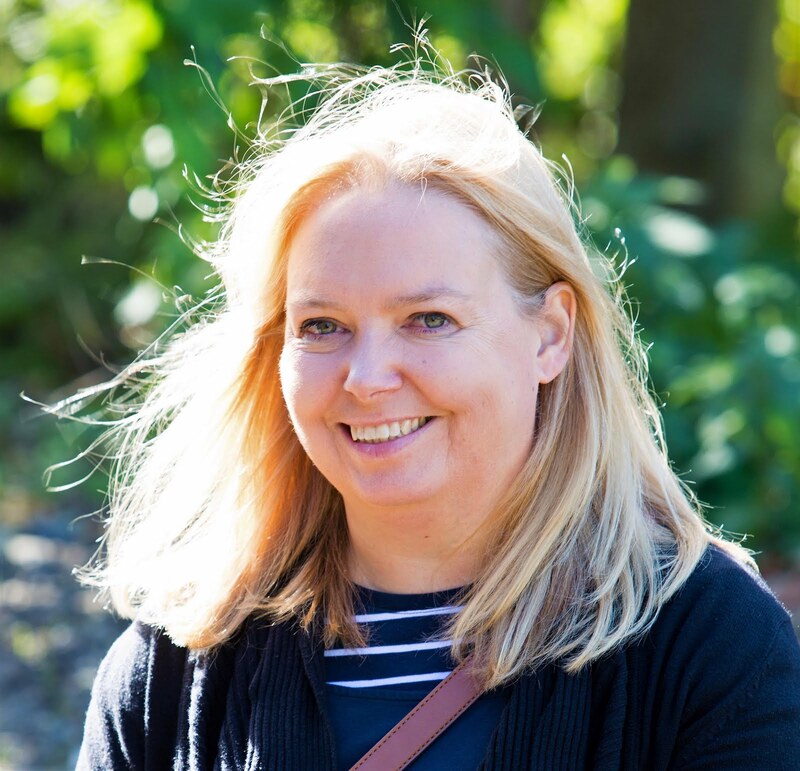 Last week we enjoyed a sneak preview as four venues opened their doors to North East Bloggers and Press and showed us what would be on offer this coming week. These included: The Prosecco Bar, Asiana, Port of Call and Serendipity Tea and Trinkets. 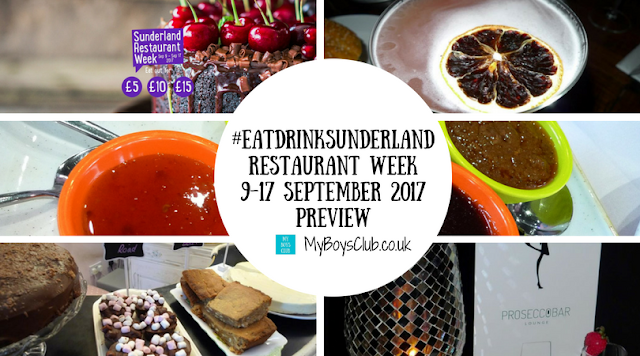 Sunderland Restaurant Week, also known as #EatDrinkSunderland, is led by Sunderland BID and is designed to showcase the wide variety of cafes, restaurants, and bars that the city has to offer. Over 50 venues will serve up special deals including include £10 for 2 courses and £15 for 3, with cafes also running a special £5 offer as the popular event returns to the city between Saturday 9 and Sunday 17 September. 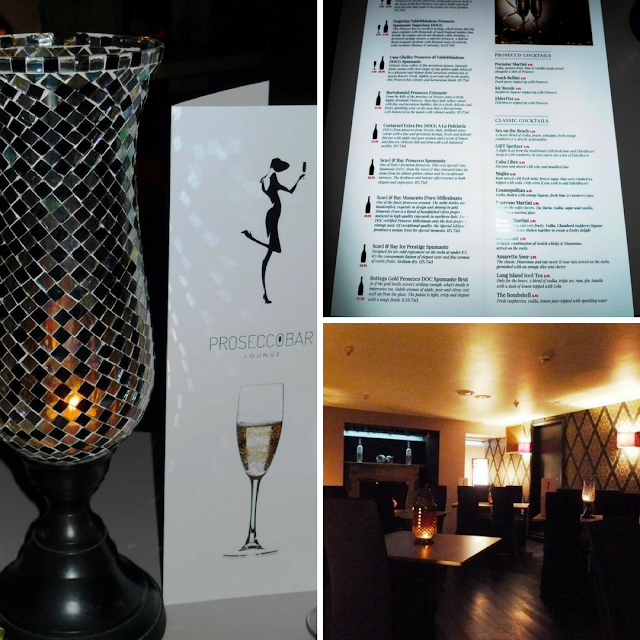 First, we started at the Prosecco Lounge on Borough Road, a bar that had yet to open to the public in Sunderland, and is found beneath The Funky Indian. I've never seen so many different types of Prosecco before, I like to drink it but I'm definitely not a connoisseur. This is a really cool bar. Dark, but with great fixtures and fittings and comfy yet stylish furnishings too. We had spicy chips and dips to accompany our Prosecco, served beautifully with a single strawberry. I imagine this will be a great bar to while away a few hours chatting with friends! At The Funky Indian during Sunderland Restaurant Week you can tuck into aromatic Indian tapas dishes while surrounded by authentic Indian décor and you can always head downstairs to The Prosecco Bar too! Just a short walk from The Prosecco Bar is Asiana Fusion. This pan Asian restaurant explores the flavours of Indonesia, Thailand, Vietnam, Malaysia and China. It is located in the Echo 24 Building on West Wear Street and overlooks the River Wear, which affords its customers amazing views of the Wearmouth Bridge and Sunderland docks. The decor is fresh and modern, there are booth seat, bigger round tables and also long tables for larger parties to sit at. And from each table, you can enjoy the panoramic views. Here we were served Vietnamese Prawn Crackers and a jam-packed sharing platter of palate-pleasers including Crispy Aromatic Duck Parcel served with Special Hoi Sin Dip, Deep Fried Filo King Prawns served with a Sweet Chilli Dip, Satay Skewered Chicken, Deep Fried Crispy Vegetarian Spring Rolls, Peking Ribs and Crispy Seaweed. My fellow diners were salivating at the meat dishes and the prawns and vegetarian dishes were so good. I only wish I could have eaten more but there were still two courses to go! 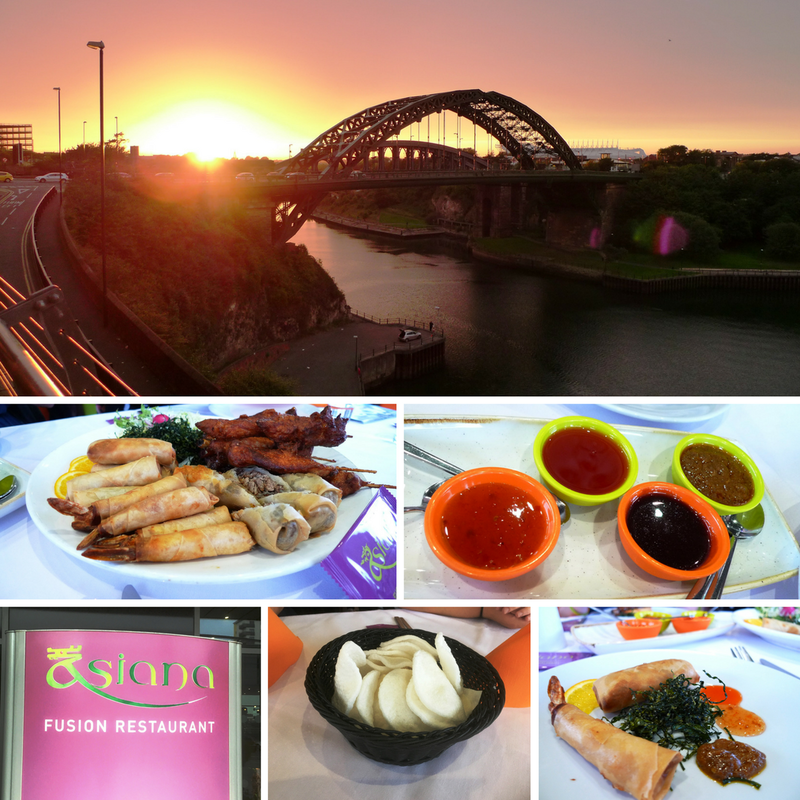 During Sunderland Restaurant Week, at Asiana Fusion Restaurant, you can enjoy 3 courses for £15 from a special menu. After tasting the food I can tell you it will be special. The food was absolutely delicious. A short drive, across the city centre, in a Station Taxis who are supporting Sunderland Restaurant Week for the second time, and we arrive at Port of Call. 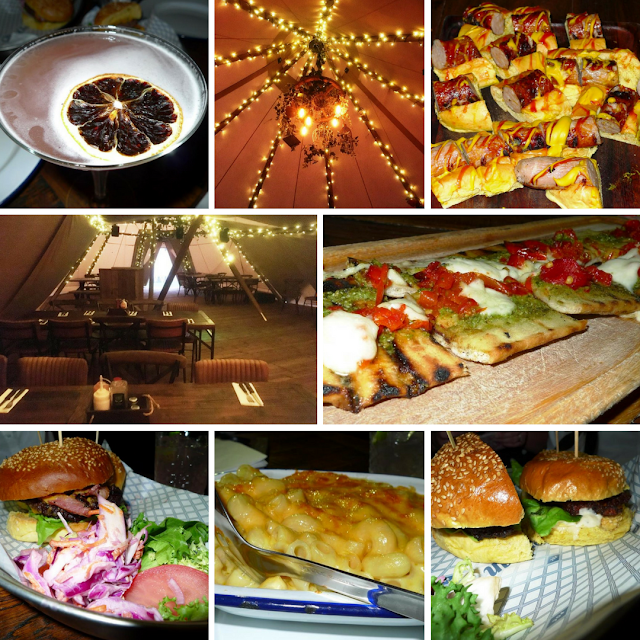 Now, this is where we have been for dessert on a previous preview night, but this time it's all about the Tipi. On land formerly used to load wagons, adjacent to the venue, two interlinked tipis, with their own bar have been permanently erected. Holding 120 people, it will primarily be used for functions and to create additional space on Saturday nights and other busy times, but it's where we enjoyed cocktails, mocktails and a burger selections, hot dogs, flatbreads and mac n cheese. During Restaurant Week at Port of Call, you can enjoy coffee and cake for £5, 2 Courses for £10 or 3 Courses for £15. Our final stop of the night is on Frederick Street and is somewhere I am so glad to have discovered. Opening especially for us Serendipity Tea and Trinkets is usually only open between 10 am and 3 pm but can open late for private engagements. 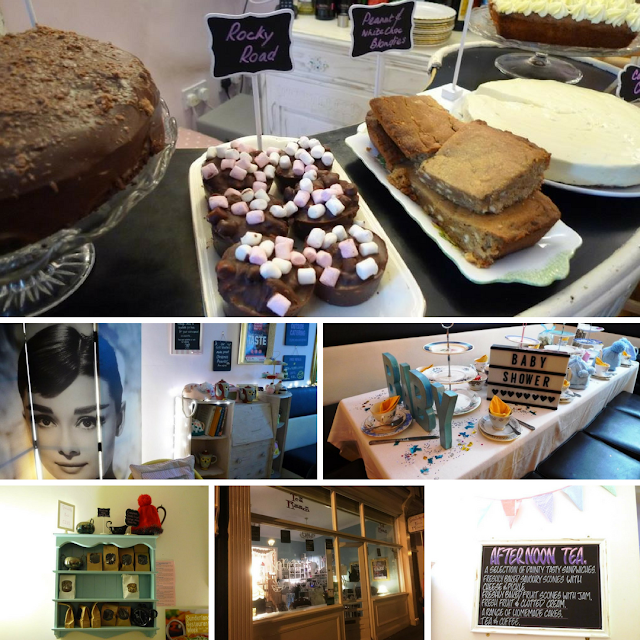 It is just the cutest vintage style tea room which serves fabulous homemade food, afternoon tea and also has a gift shop and a takeaway deli. Here we enjoyed coffee or tea, served in china cups with saucers not mugs, and had the option of Carrot Cake, Key Lime, Rocky Road, Brownies, Blondies and Death by Chocolate cake too. I have to be honest they all looked amazing but it was Death by Chocolate that I plumped for and it didn't let me down. Next time I'm in Sunderland I'll be popping in for cake and coffee. During Restaurant Week at Serendipity Tea and Trinkets, you can enjoy a pot of specialty tea and cake of your choice, plus a bag of tea to take away for £5. From the four places we visited, I can tell there are going to be some lucky diners in Sunderland next week. Now I've just got to work out how to re-arrange my diary to make the most of the week. Which restaurant would you choose? DISCLOSURE: We were invited to join a press and bloggers evening to find out more about Sunderland Restaurant Week where we received a selection complimentary food and drinks.